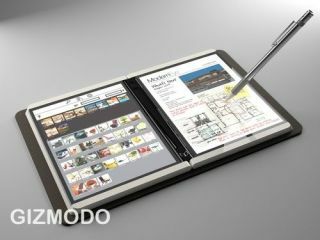 What will be inside the secret Microsoft tablet? The Courier video on Gizmodo: very slick but is it a real product? The Courier 'prototype' dual-screen tablet that's been making waves since Gizmodo released the video of it isn't an actual product. What you see in the video is an animation, rather than a physical prototype. It might be no closer to a finished product than the first 'Origami' UMPC Bill Gates showed off on stage at the Windows Hardware Engineering Conference in 2005; the reason it was so slim and light was that it was actually a slab of plastic with printouts of screenshots held behind a sheet of acetate to look like a screen. If there is a physical prototype, that still wouldn't make Courier a product that Microsoft was ready to build itself (or more likely ask partners to build). The team behind the video, Pioneer Studios (named for its downtown Seattle location close to Pioneer Square) is part of the entertainment and devices division but this is much more about research and user interaction design than finished products. An executive producer at Pioneer describes their role as leading "design incubation and prototyping" to produce "a complete product experience concept". Prototypes like Courier are concrete examples of what a product might look like and how users might interact with it, designed to inspire developers and manufacturers; the final products are often very different. When Microsoft creates a new category of hardware products like the wireless monitors or the portable media devices that came out a few years ago, it often works with Flextronics (who also manufacture the Zune and Xbox) to create a reference design that OEMs can then manufacture cheaply. For new PC designs, Microsoft will collaborate with a PC manufacturer like Acer (the first tablet PC) or HP (Windows Home Server). It worked with Asus to develop secondary displays on the top or side of a laptop to show information from Windows Sideshow like the number of unread messages you have or where your next meeting is, and Asus has been showing off a prototype dual-screen notebook. Like many PC manufacturers Asus is preparing to launch touchscreen PCs supporting the multi-touch gestures in Windows 7, but it's not likely that Courier would be based on a standard PC. For one thing, although the interface has similarities to the InkSeine note-taking software for tablet PCs produced by a team at Microsoft Research, there's no sign of the Windows interface. On the dual-screen Codex prototype that Ken Hinckley of the InkSeine team built using two OQO Model 2 tablet PCs, the taskbar may be hidden but you can clearly see the minimise, maximise and close window buttons.